All is well on their tropical vacation, until our finny friends realize the Great Conch Shell is missing! Uncle Blenny can't open the Founder's Day Festival until the heralded horn has been recovered! Your child will join Freddi Fish and Luther as they explore ancient ruins, play games at a fun-filled carnival and even discover a sunken airplane while looking for clues and finding adventure. Rosy Pearl, Pierre the Tailor and Nadine the Narwhal are just a few of the fun new friends they'll meet as they follow Old Snoggy's sniffer through this tropical paradise. In the end, it's up to your child to piece the clues together and figure out who's responsible for this underwater caper! Play again and again-new clues, new locations and new culprits await! Sing songs, play games, watch a luau and create your very own melodies. 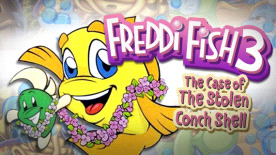 Freddi Fish 3: The Case of the Stolen Conch Shell ©2014 Tommo Inc. All rights reserved.